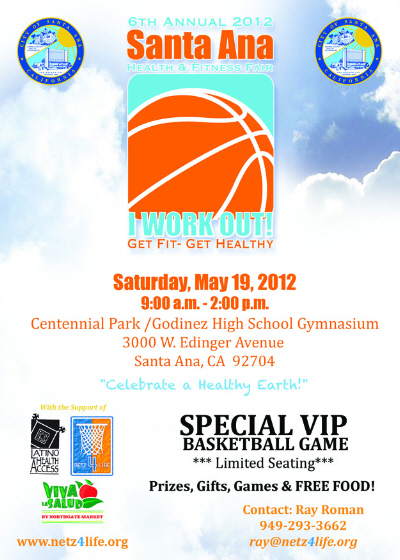 (Santa Ana, CA) – The City of Santa Ana has partnered with local Organizations such as: netz 4 Life, Latino Health Access and Northgate Markets in order to promote their 6th Annual 2012 Health & Fitness Fair at Centennial Park/ Godinez High School gymnasium. The event date will be Saturday the 19th of May, 2012 from 9am- 2pm. Over the past 6 years this event has become a celebration for local Community members, Organizations and leaders to establish the importance of being active, having fun, while endorsing the “I Work Out!” initiative, “Get Fit– Get Healthy!” This initiative has been introduced by netz 4 Life along with their “Leave No Rim Netless” Campaign and “Reaching Out- One Neighborhood at a Time” to inspire at-risk youth to become active leaders within their own community and continue to dream and believe that they too can make a difference. Councilwoman Michele Martinez ignited the Santa Ana Health & Fitness Fair 6 years ago at this exact location because she knew that it was needed for so many youth in Santa Ana. She has seen the epidemic of obesity and diabetes reaching our youth at younger and younger ages. She has been the guiding light to assist in this very important event that brings together the local community to celebrate the significant impact of “Getting Fit – Getting Healthy” in order to live a healthier lifestyle. Councilwoman Martinez has been able to continually raise funds for this event for the past 6 years through generous supporters. This 6th 2012 Annual Health & Fitness Fair of Santa Ana will be supporting local businesses and vendors, while bringing together a variety of unique talent to entertain the youth and their families in Santa Ana. The local Bordeaux Band will be kicking off the event on the show mobile along with the EnJ Entertainment group on the outdoor basketball courts promoting health & fitness through music, while the physical activities portion of the event will be provided from the OCC men’s and women’s basketball teams, the local Godinez HS basketball team, and other organizations aimed at getting healthy and staying fit. There will be a VIP basketball game including local Santa Ana Mayor and Council members, police and fire department members, along with local community leaders. The LAC Kia Fan Patrol along with the Anaheim Bolts dance teams will be performing during the ½ time entertainment of the VIP basketball game, which will also include a 3-point shooting contest between the Men’s & Women’s basketball teams of Orange Coast Community College. This special event will have door prizes that include 3 chances to win Tony Hawk bikes with safety helmets, basketballs and other items. Event shirts will be given out to the first 500 participants along with Free food, prizes and games. There will also be a chance to win a special door prize for all that attend the VIP basketball game inside the Godinez HS gymnasium. In addition, a special emcee appearance (Darrell Bailey, AKA: Clipper Darrell, the #1 Clipper fan) is expected to host the event and announce the VIP basketball game, but one must attend this great event in order to truly experience a genuine and passionate humanitarian who loves basketball and getting kids to become more active within their community! We look forward to celebrating this wonderful and unique event with all of you.